My apologies to Lemony Snicket for stealing his title. JG and I have been watching this delightful series on Netflix and it seemed appropriate given the trouble I’ve had all week in my blogging world. It started Sunday, when I logged in to write about my weekend hikers. When I tried to write a new blog all I got was a blank screen. Having recently received emails from WordPress suggesting I upgrade, I figured it was time, and maybe they were locking me out until I did. They suggested it might take a couple of days to switch to my new domain, so the blank screen kept appearing and I waited impatiently patiently. I finally got very frustrated when I was no longer able to comment on other blogs. Now I knew something was seriously wrong. I tried “chatting” with WP reps, tried phoning them (no one answered), tried sending them an email (no reply) and finally I just texted fellow blogger, and friend, LB from Life on the Bike who put me in touch with Joe from The Visual Chronicle. Joe sent me several suggestions, and of course it was the last one I tried that worked. I simply had to clear my cache – well “simply” to some. Thanks to Joe, I’m up and running again. I love the blogging world! Thanks Joe, you’re my new hero. Two fun hikes this week, first with my working friends who can only come out to play on the weekend. We did a lovely out and back on the Appalachian Trail. Then my retirees and I went to my favorite Hungry Mother. On the trip home, as everyone was thanking me for being their tour guide, I jokingly said I considered this my “volunteer” work. Between water aerobics, bridge, and hiking, I don’t have a lot of time for charity work – but I’m getting all these women out into the woods – so I think I will start putting that on my resume. A friend mentioned to me last night that she loved seeing different faces on my hikes. I never know who will show up. I love that I have such a wonderful group, and that I can always find someone to go with me. By the way, if you haven’t checked out “A Series of Unfortunate Events” on Netflix, I highly recommend it. Did not expect to see snow today. We had some snow on Saturday, but it was mostly melted by Sunday. So, we were a little surprised to arrive at Mountain Lake this morning for a leisurely hike, to see it covered in snow. Thankfully, we had all brought layers, and everyone was excited about hiking in the snow! A first for some of us. It was a beautiful day, hardly any wind, and very well marked trails. So we just enjoyed being back in the woods together. It’s fun to see the mountains in the different seasons. And the snow added an extra zing to the view, which was spectacular! These ladies did not even bat an eye when they saw the snow, I’m so lucky to have found such adventurous companions. It’s been a busy week, and we’ve had cold, rainy weather. I knew today would be the only decent day for hiking, but most of my regulars were out of town. So I rounded up a newbie who has been wanting to join the group but was afraid she wouldn’t be able to keep up. We took a relatively short hike (albeit steep in places) and stopped to catch our breath from time to time. I made sure she made it all the way. She loved being on top of the mountain, and we had a great time. Always love to see the face of someone who has discovered the joy of reaching the goal. Because the best way to hook a new hiker is to give them an awesome view. Just sharing some pictures from yesterday’s hike. It was a crisp, cool Saturday and we just wanted to be in the woods for a little hike. 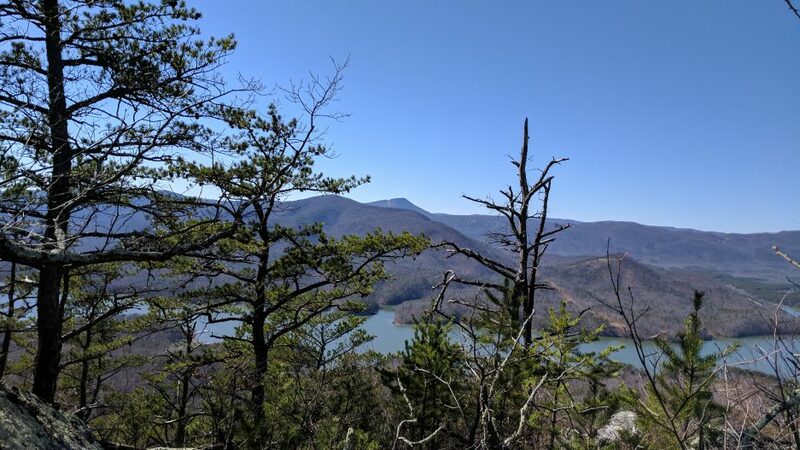 We started on the War Spur Trail behind Mountain Lake and ended up on the Appalachian Trail which took us to Wind Rock. Due to strong winds this season and heavy snow last week, there were a lot of trees down. Me, posing on Wind Rock. You can access Wind Rock by walking about .2 miles from the parking lot entrance to the AT. We’ve done that before. We were parked at the entrance to the War Spur Trail and didn’t realize the AT connection was so much longer, so instead of retracing our steps, we just walked the last two miles on the road, which followed the stream. What started out simple, ended up much longer and more challenging. Isn’t that kind of like life?